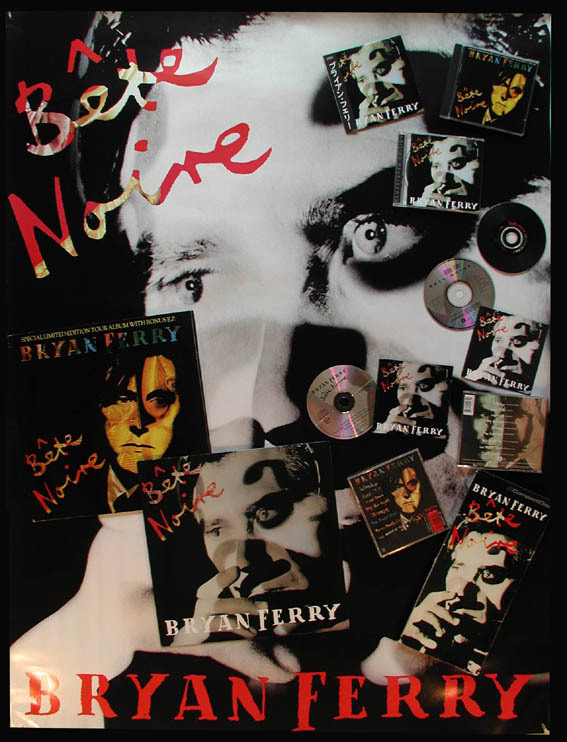 Bryan Ferry's 7th solo album and his first album for Virgin, Bête Noire, reached number 9 in UK and was released on 2nd of November 1987. The album featured several co-songwriting credits with Johnny Marr from The Smiths, Madonna's producer Pat Leonard, guitarist Chester Kamen and bassist Guy Pratt. The first single The Right Stuff peaked in UK at 37 with Kiss And Tell at 41 and a remix by Pascal Gabriel & Alan Meyerson of Limbo failed to reach the top 100. The USA CD had a different rear sleeve to the European versions and a 13 track limited edition was released in Australia during the 1988 tour. The 4 additional tracks were extended version of the 3 single s and an instrumental version of the title track. The Right Stuff (12 An extended version for the 12" single. The Right Stuff (Dub Mix) An extended altrnative mix found on the 12" single. Kiss And Tell (Single Mix) The single had a shorter edit. Kiss And Tell (Dance Mix) An extended version for the 12" single. Kiss And Tell (Dub Mix) An alternative version found on the 12" single.